PRAYER! – Please be in prayer for the Franzone family as they travel down this road of adoption for the 2nd time. 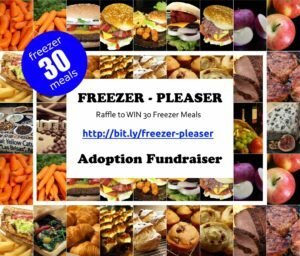 DONATE MEALS – We need donations for freezer meals. They need to feed at least one family of 4 and freeze well. If you are willing to donate a frozen meal, please contact India Gatewood. (If you don’t know how to contact her, please comment below to request details and we’ll try to arrange that.) You will get 1 FREE raffle ticket for donating a meal. BUY RAFFLE TICKETS – 1 Ticket = $5 (USD) or 5 Tickets = $20 (USD). 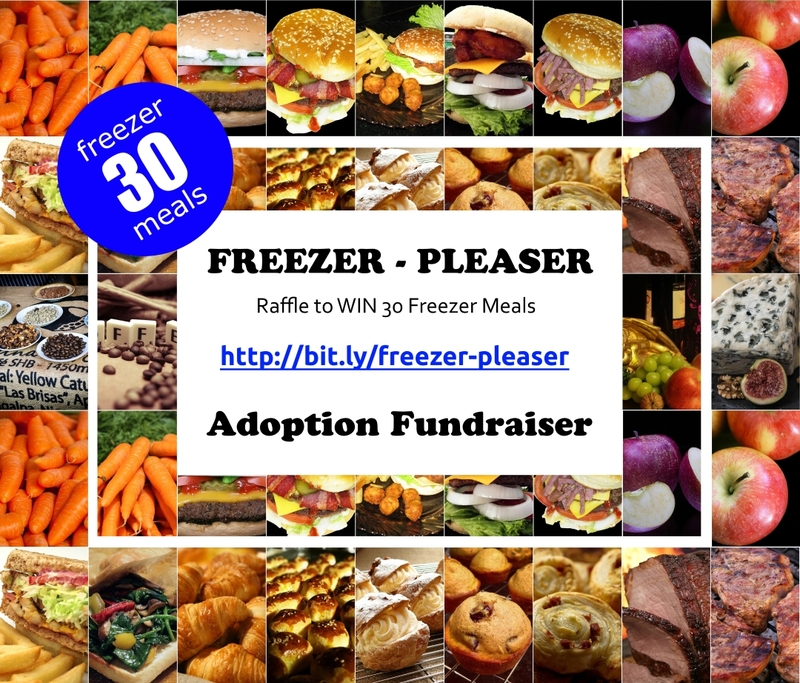 Each ticket is a CHANCE OF WINNING 1 MONTH WORTH OF FROZEN MEALS! This is awesome, especially with the Holiday season nipping at our heels and as schedules become even more hectic than usual. SHARE THE LOVE! – You can share this post via any means at your disposal (email, Facebook, Twitter, Instagram, Pinterest, etc.). Heck, you can print it off and hand it out if you like. Just help us get the word out! There is an Instagram-worthy image at the bottom for sharing. Tickets are on sale NOW and the drawing will be held at the end of October. NOTE: To participate you need to be local(ish) to the Gulf Coast area (Escambia County, Santa Rosa County, Jonathan’s coworkers, etc.). Basically, we need to be able to get the food to your house (driving) without it all thawing out and the point is to raise money, not spend it on shipping. Thank you for understanding! You can make payment via PayPal. Send to the account jonathan _at_ franzone _dot_ com and use the friends & family option. Your tickets will be placed in a sealed envelope and sent to you once payment is made. Please email me at aubrey _at_ franzone _dot_ com and let me know that you’ve sent payment and once that is received, I will send your tickets to you. Please include your address if you are not local. Pay directly to India Gatewood (if you know how to find her). If you would like purchase raffle tickets in person (i.e. at CC community day, church, or other) please email me and let me know how many you would like and we can make arrangements to get those to you. * NOTE: The email addresses above should be read by you (a human) and translated into our actual email addresses. Writing them as they are above keeps the mean spam robots away. Custom... buy as many as you want! Please share this image to get the word out! Franzone Adoption Kickoff – WIN This Awesome Quilt!